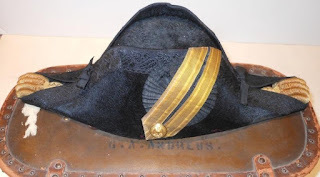 The latest Historical sew fortnightly challenge was "embellish". Since this is a busy time of year for me, I decided to keep things simple and just decorate a hat. I bought a bunch of wide-brimmed wool hats from Target last year, and I thought these would make a wonderful pirate hats. All they need is some wire around the edge and a bit of trimming. I bought the vintage trim that I used around the edges at the Antique Elegance show two weekends ago, but everything else came from my stash. After I wired and bound the edges, I folded the brim up and stitched the edges together at the sides to keep it in place. I also added tassels to the ends like you see in some period bicorns, but I chose tassels that were raggedy and worn to make it look more pirate-ish. I decorated the front with a ribbon cockade made with the wonderful instructions on the blog Idle Hands (part 1 and part 2). 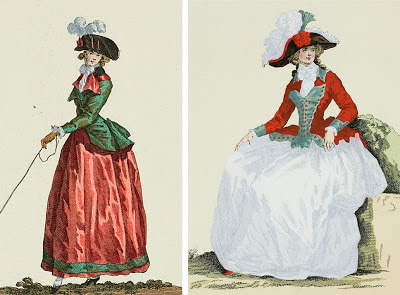 I also added a bunch of feathers to the top based on two 1780's fashion plates from Galerie des modes et costumes français showing women wearing heavily embellished bicorns. And that's pretty much it! All of the embellishment was hand-sewn, and it probably only took me 3 hours from start to finish. Here are a few more pics to show how it looks for other sides. 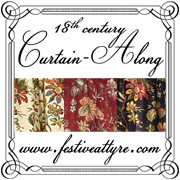 We are going to have a Curtain-Along meetup at Costume College this summer! And while I still haven't found the time to make my Curtain-Along jacket, I was able to sneak in a smaller curtain project for the Historical Sew Fortnightly undies challenge this week. 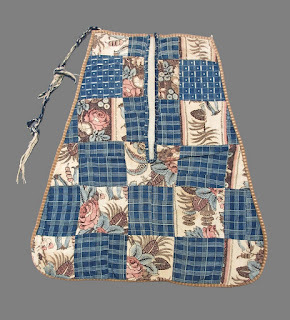 I made a patchwork pocket inspired by this one from the Winterthur Museum. I used one of the curtain tie-backs to cut blocks of the printed fabric, and then I dug out some scraps from my ikat open robe for the blue pieces. The striped binding and backing fabrics are also from my scrap bin. I cheated a little and machine-sewed the piecework, but the binding is sewn by hand. 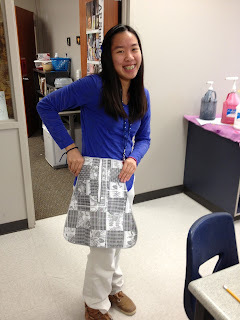 The most noteworthy thing about this project was discovering how HUGE 18th c. pockets were! The original pocket that I based mine on is 16" long. When I blew it up to full size to make a pattern, I thought it must be a mistake because it looked so crazy big. I even made one of my students model it so you can see the scale. But it is definitely not a mistake. When I looked at other examples I discovered that this size is actually quite average. I had no idea! We decided that 18th c. women must have been carrying whole chickens around in these things. For my own version of this pocket, I reduced the length to 14", which is still quite large, but at least my hands can reach the bottom of it now. Just for a bit of fun when I wrap up the Curtain-Along in September, I thought I would do a giveaway with this pocket as the prize. We can make a final list of all the Curtain-Along projects that people have made this past year, and then I'll hold a random drawing and send this pocket to one lucky person as a little thank-you for participating. And just as a reminder, check out my Pinterest board for all of the pin-able Curtain-Along projects that I know of so far. If you have seen others or have made something yourself, please let me know so we can all check them out. And remember, if you don't have a blog, I am happy to feature your work or let you do a guest post here too. If you are new to this project or just looking for inspiration, I also have a board of Georgian Indienne print inspiration pics to get you started.